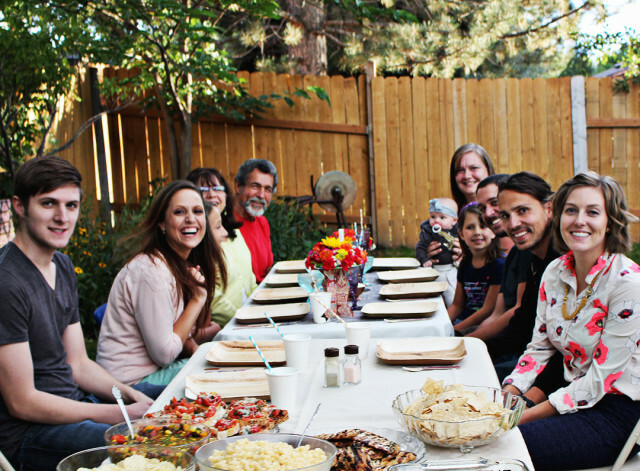 Well luckily for us, this year could be different and so of course we had to throw a little party with our family to commemorate it! It was a simple dinner but I love how the presentation turned out. We went with a glamorous, bohemian look mixing ornate glasses, copper accents, gorgeous printed papers and natural elements like wood and fresh flowers. 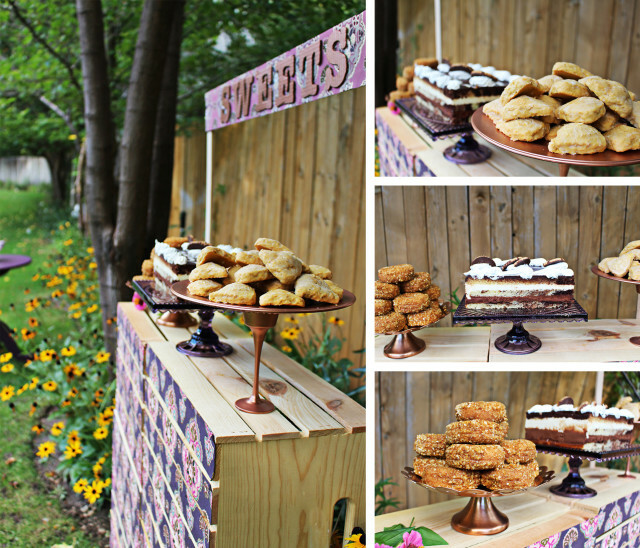 One of my favorite parts of this party was this gorgeous treat stand. 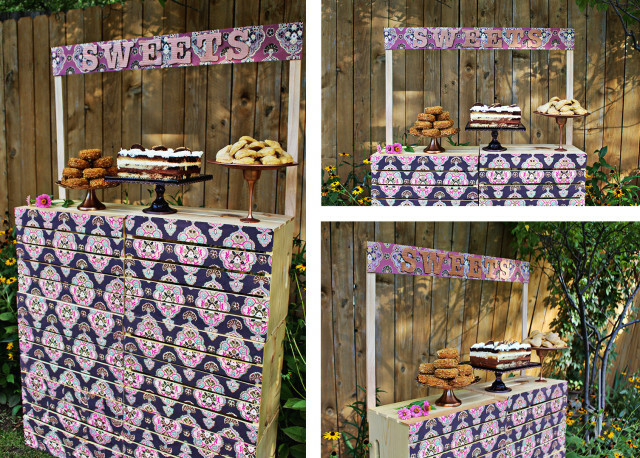 Built from wood crates and decoupaged with World Market paper, it turned out to be such a vivid accent. Plus, topped with those yummy treats, don’t you just wanna stare at it?! Stay tuned for the tutorial on how we made it! 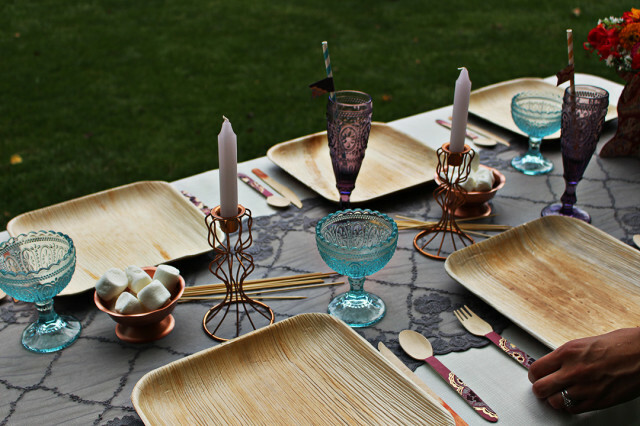 The table scape featured these eco-friendly plates made from naturally fallen leaves and they added such a fresh, gorgeous textured look, don’t you think? 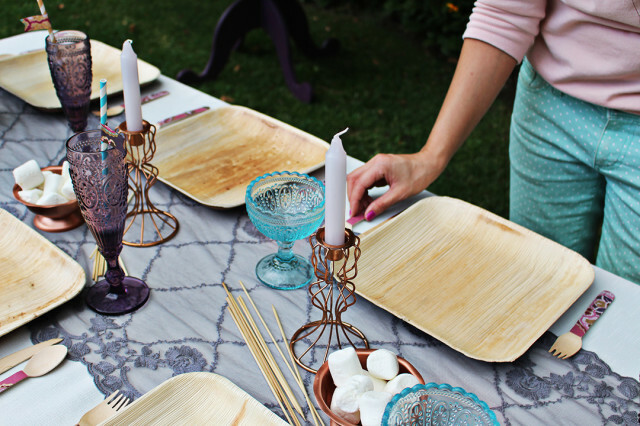 We surrounded the plates with our favorite wood utensils that we also covered in our papers as well as lightly stroked with copper and gold paints. I’ve always loved the mix of glamorous and rustic and our ornate glassware paired with our recycled tree dinnerware accomplished this perfectly. We found these cups at Hobby Lobby a few months ago, crazy right? They’re food safe and were on sale for SUCH a great price. We just couldn’t pass them up and boy am I glad we didn’t. Even if they never made another appearance in my life, it would be worth it just for this party! 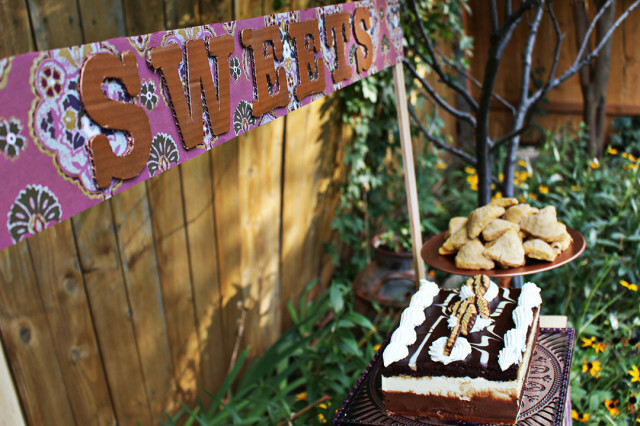 We inserted paper straws with sweet little flags also made from that same gorgeous paper. Oh how we love World Market’s handmade papers. Should we talk about our flower arrangements?! 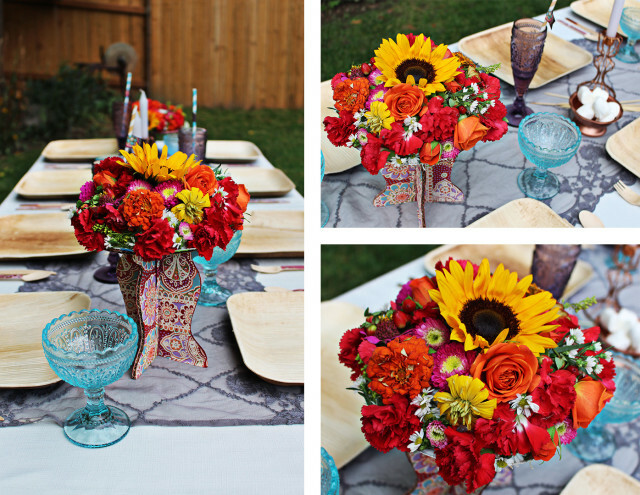 We topped our cardboard cake stands with an assortment of autumn-y colored flowers and we have to say we’re in love with the result! A tutorial coming soon on those as well! 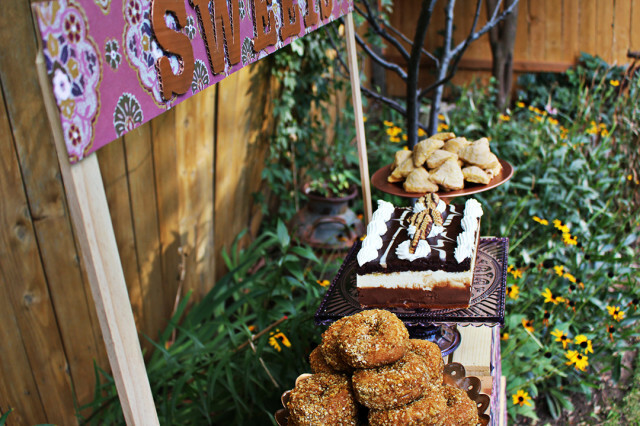 Another favorite feature was the toasted marshmallow stations we set out on the dinner table. 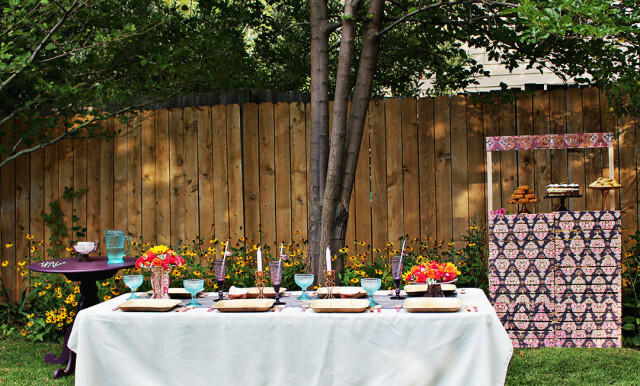 At any time inspiration hit, our guests could spear a mallow and go to town! Mmmm, this makes me want a toasted marshmallow RIGHT NOW! And of course we loved the copper accents here. 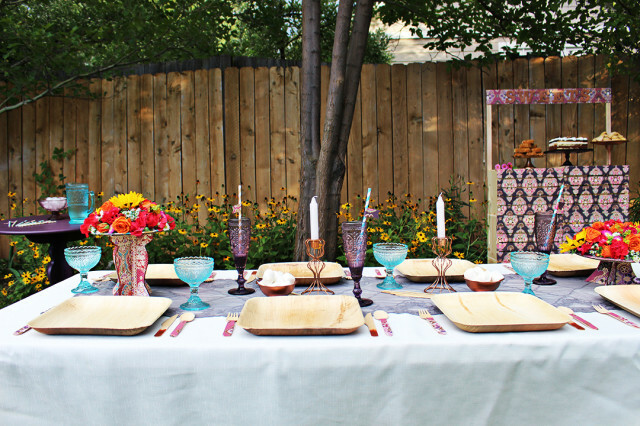 The candlesticks are from H&M and the bowls we painted ourselves from thrifted finds. 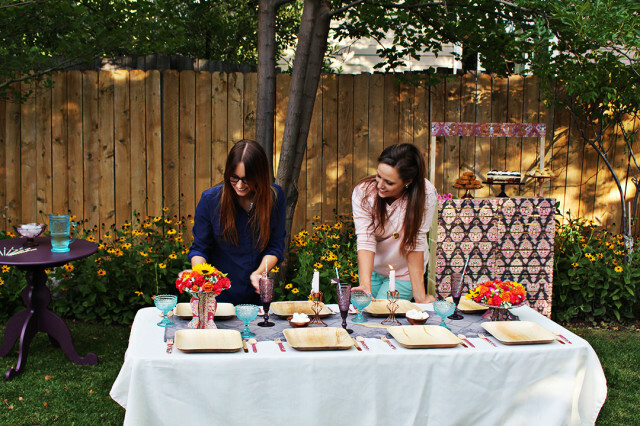 Really, we could not have been happier with our a quickly thrown together dinner party turned out! Especially because that day called for rain but actually ended up being perfect. Hmm, I guess even the sky knows not to mess with us on our birthday. 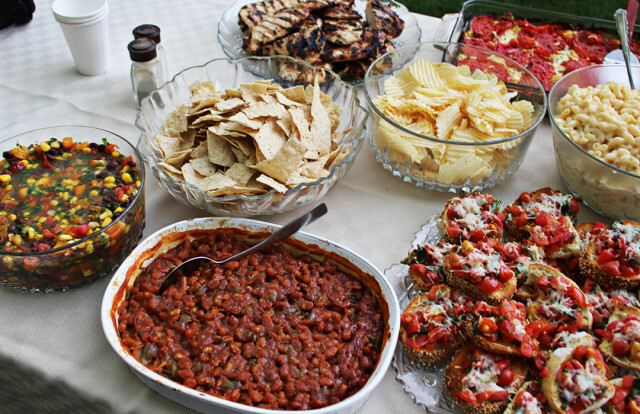 Our mom graciously prepared a DELICIOUS meal full of fresh garden items and the dish we chose every. single. year. until we moved out: mac n’ cheese. My dad makes the most delicious mac n’ cheese. Second only to Kraft. Yes, we really really love that fake-orange colored juvenile deliciousness. 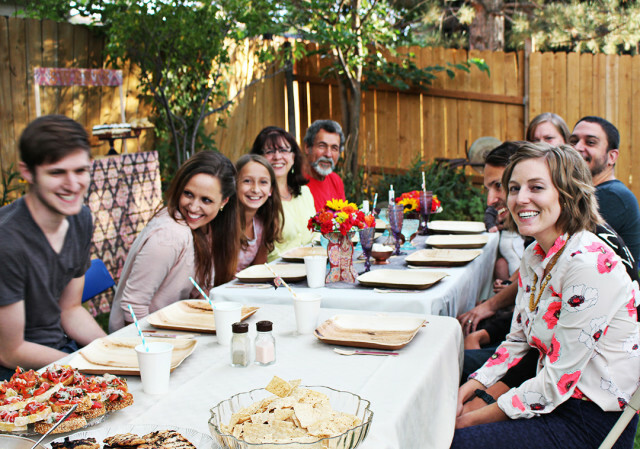 And look how cute our family is here about to enjoy this fabulous meal. We’re lucky, lucky girls and I miss Malissa so badly already :( At least I have the memory of this party to keep me going until Christmas.